MenEssentials recently got in touch with us and asked we write a little blog post about some products we happen to both like. Now I know what you're thinking "Saul's why would tell us about a shop that carries a lot of the same stuff as you?" to be honest it's because sales aren't a huge deal to us, we truly believe at-home care will only extend the results of the services you receive from us and build on them. We try and test every product we sell but we know a lot of spas get pushy about sales, and sometimes don't even offer an educated reason for buying something. So for our clients who live in the east end, it can be nice to have a closer to home option for refilling your some of your beard or shave products when can't make the trip here. So, since we love our services lets start with some products that you might have experienced while receiving a facial with our beard conditioning treatment! Bluebeard's Original Beard Wash is a great SLS free wash that won't over strip the skin under your beard, but contains lime essential oil which helps break down food smell. 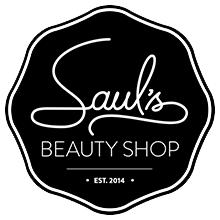 As you know Saul's is SLS, mineral oil and petrolatum free. SLS is a cheap detergent that cleansers love to throw in because of it's satisfying foaming experience, it's also used to clean engine parts! Now while you may have a powerhouse of a face, it deserves only the kindest of ingredients! A little goes a long way with this wash and we recommend using it in shower for easiest rinsing. Bluebeard's Wonder Beard is an intense conditioning mask for your beard! This product is a must in our beard conditioning treatment, we'll use it as a base and blend in some Aromatherapy Associate's face oil or Eminence treatments to give you a truly custom experience. We love the scent of this mask, and so will your partner. This is great for if your beard is getting extra fluffy, unruly or wiry. It'll help coax the cuticles of the hair back to a settled down point and make styling significantly easier. A regular extra conditioning treatment is especially important for longer (or soon to be longer) beards, as you want to keep the hairs strong but flexible to lower breakage. Every guy with a beard knows a romantic evening starts with a soft, not irritating, beard, this treatment will help get you through the awkward growing in weeks and also give your special person something extra smooth to run their hands through when you're beard is fully formed. It's unique in application because this is meant to be rinsed out, you apply a layer after cleansing, let sit for a few minutes and then rinse out. From there you can decide if that day you want to do an oil/balm or not. Alum Bloc: Menessential's is a fan of Osma's Alum Bloc, we sell Omega's alum stick. The difference is, quite frankly, minute. I will say that Osma's looks cooler than Omega's as it comes in the shape of a small bar of soap. Alum sticks/blocks are fantastic as an after shave (or Eliss will use it after waxing) product to disinfect the pore and prevent breaks out while soothing the skin. If you have any cuts, it will sting at first, but it also helps slow down the bleeder. You simply run it over a wet face, let sit for a minute and then rinse off with water. You get a bit more leeway if using after waxing on the body, like for underarm, as it can replace deodorant temporary because of it's disinfecting properties.